BINUS SCHOOL Simprug students from the Class of 2022 will be hosting a fund raising charity dinner on Friday, 24th of November, 2017, to raise funds for The Aspinall Foundation – a wildlife conservation group from the UK founded by zoo owner John Aspinall. The charity dinner is a continuation of the “Greencamp” Campaign in which the Class of 2022 partook in a community service program for primates in Ciwidey, Bandung. The program was organized by the Indonesian chapter of the Aspinall Foundation, which focuses primarily on Javan Primates. 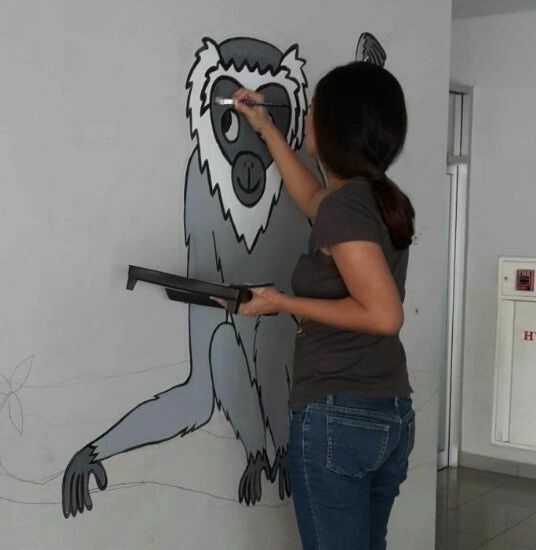 As part of their dedication to the program, the Class of 2022 have made their new mascot the Javan Gibbon, and have even painted a mural of their mascot on the wall of their designated “Home” area at BINUS SCHOOL Simprug. The charity dinner will be held at BINUS SCHOOL Simprug on the 5th floor of Tower C. For more information on this event, please contact the Class of 2022 Grade Level Head Mr. Patrick Laughlin.